The next OU Math Day will be on Thursday, November 15th, 2018. The University of Oklahoma's annual Math Day is a day of math-themed competitions and events for high schoolers in the Oklahoma and Texas areas. Compete in the Sooner Math Bowl. Solve challenging puzzles and win prizes. Meet students from all over Oklahoma. Visit the picturesque Norman campus of the University of Oklahoma. and listen to our exciting guest speaker. Directions: The OU Math Day will take place in the OCCE Forum Building, 1704 Asp Avenue, Norman, OK. Click here for directions. Parking is available on northwest corner of Asp and Kellogg. Important: All students must be accompanied by one chaperone per 12 students. 10:00 - 10:30 am: Registration in OCCE. 10:30 - 10:45 am: Welcome address. 10:45 - 11:15 am: Tests. 11:30 - 12:00 pm: Sooner Math Bowl, Round 1. 1:15 - 2:15 pm: Sooner Math Bowl, Round 2. 2:30 - 3:15 pm: Invited Speaker. 3:15 - 3:45 pm: Awards ceremony. A pdf version of the poster is available here. Questions? 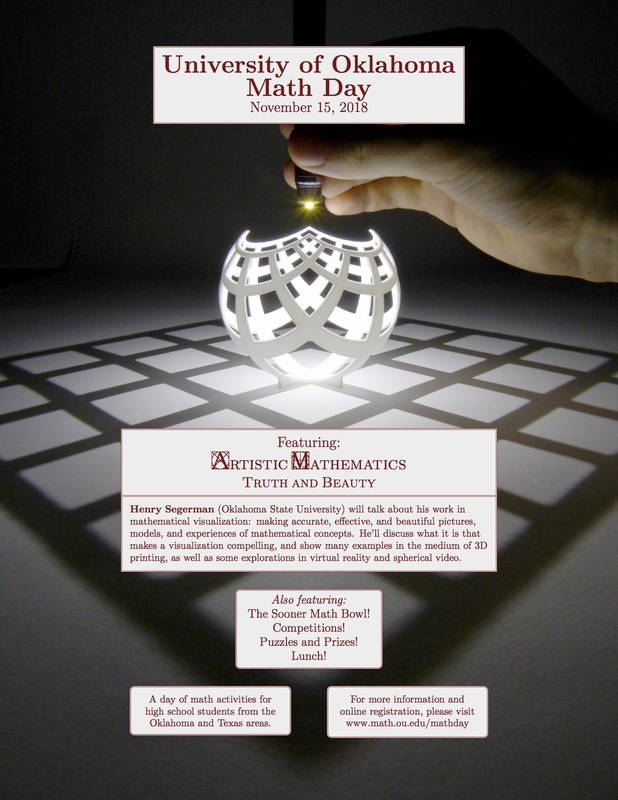 Please contact Greg Muller at mathday@ou.edu.